For dependable advice about your best approach for taking care of traffic tickets and avoiding the risk of or dealing with a driver’s license suspension, contact us today for a free confidential consultation. The Boston law firm of Attorney Topazio has the experience and understanding of the different ways of resolving traffic violations can help you maintain your driver’s license, keep your insurance rates down, and for commercial drivers, protecting your CDL license and your livelihood. For example, we help drivers with speeding tickets and other citations take care of traffic ticket violations at the earliest possible stage: the appeal of a ticket at the initial clerk’s hearing. A favorable resolution at the next appeal stage, the district court level, is generally more difficult to achieve because the arresting officer will probably appear to explain the details of the ticket violation to a judge. Will your next speeding ticket result in a suspension of your driver’s license? Like many other states, Massachusetts has a points system that requires suspension or revocation of your license depending on the number and severity of traffic violations you accumulate over a given period of time. For example, three speeding tickets in a single year will result in a 30-day suspension. Twelve speeding tickets or moving violations in a 5-year period will mark you an habitual traffic offender resulting in a 4-year license revocation. Our ability to take care of traffic ticket violations for many drivers can help you avoid the problems that a series of tickets can cause for you over time. Traffic ticket clients at our law firm include local drivers throughout the Greater Boston area, commercial drivers based in Massachusetts or traveling through the state, underage or juvenile drivers, college students, and private motorists from other states who get tagged for moving violations on I-95, Route 1, Route 128, Route 93 or the Mass Pike. Attorney Topazio is an experienced traffic ticket lawyer who can provide representation for all traffic tickets and traffic citations, including speeding tickets, stop sign tickets, red light violations, marked lane violations, license suspensions, unlicensed operation violations, and criminal traffic citations, to name a few. Protect yourself from points on your license and higher insurance rates caused from a bad driving record. Don’t pay that ticket until you speak with Attorney Topazio. Your driver’s license is a privilege, not a right, and can be taken away or suspended when you accumulate too may motor vehicle traffic violations. If you received a traffic ticket or civil motor vehicle traffic citation, call Attorney Topazio to evaluate your case. He is an experienced Traffic Ticket Attorney who can answer any question you may have. To see how our detailed understanding of Massachusetts traffic ticket violations law can benefit you, contact Boston Criminal Defense Lawyer Steven J. Topazio for a free confidential consultation. Speeding Ticket, 700 CMR § 7.08(6)(a), Violator found Not Responsible after Clerk’s Hearing. The client, a plumbing contractor, received a speeding ticket alleging that he was traveling 58 mph in a 35 mph zone in the Ted Williams Tunnel in Boston hired Boston Attorney Steven J. Topazio to represent him. Attorney Topazio explained to his client that by committing the traffic violation of speeding, the Massachusetts Registry of Motor Vehicles would add two (2) points to his driving record if he were to be found responsible for the violation. If found responsible, the Merrit Rating Board would assess the client two (2) surchargeable points which would result in increases in his client’s car insurance premium. Two (2) surchargeable points would result in a 30% increase in his client’s insurance premiums for a period of six (6) years. Today, Attorney Topazio persuaded the Clerk to find his client not responsible. Motor Vehicle Traffic Citation, Speeding MGL c. 90 § 17, After Clerk’s hearing the violator was found not responsible. The client, a Metro Cab driver, hired Boston Criminal Lawyer Steven J. Topazio after receiving a civil motor vehicle citation for speeding. According to the citation the client was traveling 51 mph in a 35 mph zone on Soldier’s Field Road. Attorney Topazio was successful in persuading the Magistrate to find his client not responsible. Motor Vehicle Traffic Citation, Prohibited left turn, After Clerk’s hearing the violator was found not responsible. The client, a software engineer, hired Boston Criminal Lawyer Steven J. Topazio after receiving a civil motor vehicle citation alleging that he made a prohibited left turn. The client reported that he dropped his mother off at the airport, returned to Boston on his way to the City of Cambridge and got off at Government Center exit because he missed the Storrow Drive exit and ended up on North Washington Street. He was stopped by Boston Police when he turned left onto Causeway Street contrary to a posted sign which indicated no left turn between a certain designated time. Attorney Topazio persuaded the Clerk Magistrate, based on the circumstances, to find his client not responsible. The client, a 33 year old hotel employee, received a citation for speeding, hired Boston Criminal Attorney Steven J. Topazio to represent him at a Magistrate Hearing. According to the citation, the client was caught on lidar traveling 60 mph in a posted 40 mph zone on Soldiers Field Road. Today, Attorney Topazio persuaded the Magistrate to find his client not responsible. Result: Client found Not Responsible and avoids fine as well as insurance surcharge. The client, a 53 year old truck driver from Illinois, hired Boston Criminal Defense Lawyer Steven J. Topazio to represent him at a Magistrate Hearing after he was charged with motor vehicle violations after knocking down a street light which he struck with his tractor trailer. In preparation of the Magistrate’s Hearing, Attorney Topazio obtained a copy of his client’s clean driving record (except for this matter), and a letter from Carolina Casualty Insurance showing property damage payment of $4,084.93 for the damaged street light, as well as a letter from his client’s employer J.B. Expedited of Illinois indicating that his client cannot have any violations within the first 12 months of his employment otherwise he could be terminated from employment. Today, Attorney Topazio pointed out that his client making a delivery to Harvard University, got on a street where tractor trailers are prohibited, tried to back up and hit a (sign/pole), then called police as well as reporting the damage to security. Attorney Topazio stressed to the Magistrate that his client waited for over an hour for police to arrive and when they did they gave him a ticket due to the damage. Attorney Topazio was successful in persuading the Magistrate to find his client not responsible by arguing that his client did the right thing by calling police after the accident, despite being unfamiliar with the area; and proved that his client’s insurance paid for the damage he caused. Result: Client found Not Responsible and saves his job. The client, a 22 year old pizza delivery driver, hired Boston Criminal Defense Lawyer Steven J. Topazio after receiving a traffic ticket for speeding, traveling 85 mph in a 55 mph zone. Attorney Topazio argued to the Clerk Magistrate that his client moved from the middle lane to the left lane in an attempt to pass another driver when he was clocked by the officer during that maneuver, and disputed the officer’s calculation of his client’s speed. Attorney Topazio argued that in order to determine speed, the officer would have had to have followed his client for at least ¼ mile and persuaded the clerk to find his client not responsible. The client, a BU Dental School graduate, was taking his wife to work and received a traffic citation when he got stuck in the middle of a busy intersection then proceeded through the intersection after the light turned red, hired Boston Criminal Defense Lawyer Steven J. Topazio to represent him. Today at his clerk’s hearing, Attorney Topazio persuaded the Clerk Magistrate to give his client the benefit of the doubt arguing that it was safer for his client to proceed through the red light then to cause grid lock. The Clerk Magistrate agreed and found his client not responsible of the violation. The client was in the Seaport area in South Boston and took an illegal U-Turn in front of a State Trooper. He was then issued a citation for a U-Turn violation and hired Boston Traffic Lawyer Steven J. Topazio to represent him. Today, Attorney Topazio found convinced the Magistrate to find his client not responsible arguing that his client did not see the traffic signal. The client, a 30-year old IT professional, received a speeding ticket on the Massachusetts Turnpike, Route 90, and appealed the ticket. After the client was caught on Lidar traveling 80 mph in a 65 mph zone, the client hired Boston Traffic Ticket Attorney Steven J. Topazio to represent him. A responsible finding on a speeding ticket will result in a two point surcharge for insurance purposes. Each point will result in a 15% increase to insurance premiums, for a total of a 30% increase in his client’s insurance premiums. Today, Attorney Topazio persuaded the Clerk to find his client not responsible. The client, a 27 year old Guatemalan citizen, was charged with leaving the scene of property damage after rear ending another vehicle, was represented by Boston Traffic Lawyer Steven J. Topazio. The client was not a United States citizen and wanted to avoid any sentence that might result in immigration consequences. For this reason Attorney Topazio rejected the district attorney’s offer of a continuance without a finding “CWOF” and suggested a six month term of pre-trial probation. Attorney Topazio sought permission for his request for pre-trial probation from the assistant district attorney’s supervisor. Attorney Topazio obtained documentation from his client’s insurance carrier which indicated his client reported the incident to the insurance company five days after the incident, despite the complaint issuing some three months after the accident, and provided that information to the supervisor. The District Attorney’s office agreed with Attorney Topazio’s request and the court imposed pre-trial probation for six months with the condition that the case would be dismissed if there were no further problems. There was no admission to any crime and no immigration consequences to the client. Result: Case to be dismissed after period of pretrial probation. The client, a 36 year old Amtrak operator, received a traffic citation after running a red light in Malden, hired Boston Traffic Lawyer Steven J. Topazio to represent him. Attorney Topazio met with his client and learned that his license was suspended for unpaid tickets. Attorney Topazio worked with his client to restore his driving privileges. Today, Attorney Topazio persuaded the district attorney to grant his client pretrial probation in lieu of admitting to the charge and the court agreed. The client, a 43 year Treasury Department employee, received a traffic citation after running a red light in Roxbury, hired Boston Traffic Lawyer Steven J. Topazio to represent him. Attorney Topazio advised his client to appeal his ticket. Today, Attorney Topazio argued that his client inadvertently ran the red light after getting lost yet acknowledged the officer’s hard work and safety concerns, but nevertheless convinced the Magistrate to find his client not responsible. The client, a 21 year old college senior, was stopped for speeding after being caught on Lidar traveling 52 mph in a 35 mph zone and thereafter was giving a citation for speeding and operating a motor vehicle with a suspended license when it was discovered that the client’s driver’s license was suspended, hired Boston Criminal Defense Lawyer Steven J. Topazio to represent him. Attorney Topazio learned that his client’s license was suspended for three surchargeable events. Massachusetts has a bad driver point system which is called “surchargeable points” and is based on the state’s Safe Driver Insurance Program. Every time a motorist is found responsible for a moving violation―like a speeding ticket, for example―he gets a “surchargeable event” on his record. In Massachusetts if you are found responsible for three speeding violations within a 12 month period, your driver’s license will be suspended automatically for 30 days. Attorney Topazio instructed his client to request a Magistrate’s hearing and to take all steps necessary to reinstate his driver’s license. 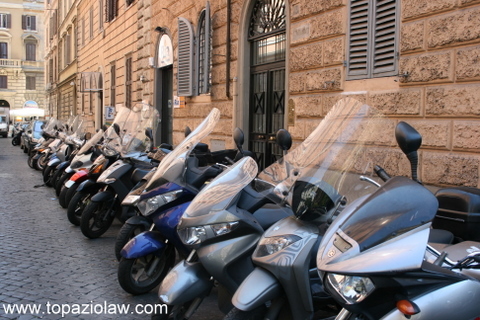 Today, Attorney Topazio convinced the Clerk Magistrate not to issue a criminal complaint against his client or to find him responsible for the speeding violation on the condition that if the case is continued for three months and his client return to court after three months without any further motor vehicle violations, then both charges would be dismissed. Result: Case to be dismissed and client avoids a surcharge and increase in his insurance rates. The client, a 38 year old Software Engineer and father of two, received a speeding ticket on the Massachusetts Turnpike, Route 90, after being caught on Lidar traveling 84 mph in a 65 mph zone, hired Boston Traffic Ticket Steven J. Topazio to represent him. A responsible finding on a speeding ticket will result in a two point surcharge for insurance purposes. A two point surcharge will result in a 30% increase in his insurance premiums. Today, Attorney Topazio argued that his client was passing another vehicle and momentarily accelerated speed to effectuate the maneuver and persuaded the Clerk to find his client not responsible. The client, a 23 year old senior at Salem State College, received a traffic citation for traveling in the HOV lane of the Mass Pike by herself, hired Boston Traffic Lawyer Steven J. Topazio to defend her. The HOV lane is a high-occupancy vehicle lane (also known as a HOV lane or carpool lane) and limited to vehicles with two or more occupants to use these lanes. Attorney Topazio learned that his client was following her GPS while on Route 93 south when her GPS lost its signal, and entered the HOV lane by mistake. Today, after a full hearing, Boston Traffic Attorney Topazio argued that his client did not see the HOV sign on the Mass Pike and persuaded the Magistrate to find his client Not Responsible. Result: Case dismissed after finding of Not Responsible. The client, a 61 year old owner of a courier business, received a traffic citation for failure to stop or yield hired Boston Traffic Lawyer Steven J. Topazio to represent him. Attorney Topazio obtained a map of the intersection so as to diagram his client’s movements. Today, after a full hearing, Boston Traffic Attorney Topazio persuaded the Magistrate to find his client Not Responsible. The client, a 52 year old cab driver, received a traffic citation for failure to yield for an emergency vehicle and appealed to a Magistrate Hearing. The client represented himself at the Magistrate Hearing but was found responsible and appealed again to a full hearing before a judge, but this time hired Boston Traffic Lawyer Steven J. Topazio to represent him. Today, after a full hearing, Boston Traffic Attorney Topazio elicited from the State Trooper that his client in fact yielded for his police vehicle but not fast enough for the officer’s liking, but nevertheless was able to convince the court to find his client Not Responsible. A 34 year old message therapist hired Boston Traffic Attorney Steven J. Topazio to represent him after receiving a speeding ticket on Mystic Avenue in Somerville. The ticket alleged that the client was caught on Lidar traveling 48 mph in a 30 mph zone. Today, Attorney Topazio convinced the Magistrate to find his client Not Responsible. The client, a 30 year old computer programmer, received a traffic ticket for failing to stop for a stop sign hired Boston Traffic Ticket Attorney Steven J. Topazio to represent him. Today, Attorney Topazio obtained a map of the intersection and argued that his client entered an intersection that was more conducive to a yield sign than an stop sign but nevertheless proceeded with caution when he rolled through the intersection instead of coming to a complete stop and persuaded the Clerk Magistrate to find his client Not Responsible. The client, a 24 year old graduate student, received a speeding ticket on the Mass Pike after being caught on Radar traveling 72 mph in a 55 mph zone, hired Boston Traffic Ticket Attorney Steven J. Topazio to represent him. Today, Attorney Topazio argued that his client increased his speed to avoid an aggressive driver behind him and persuaded the Clerk Magistrate to find his client Not Responsible. The client, a college student, received a speeding ticket after being caught on Lidar, hired Boston Traffic Ticket Attorney Steven J. Topazio to represent her. The client was cited for going 48 mph in a 30 mph zone. Today, Attorney Topazio persuaded the Clerk Magistrate to find his client Not Responsible. The client, a 35 year old taxi driver, received a traffic ticket for speeding after being caught on radar traveling 40 mph in a 30 mph zone, hired Boston Traffic Ticket Lawyer Steven J. Topazio to represent him. Today at the Magistrate hearing, Boston Traffic Ticket Lawyer Topazio persuaded the Magistrate to grant his client consideration due to the fact that although his client admitted to dropping a fare off at Logan Airport then cut through Chelsea where he was stopped, in mitigation Attorney Topazio established that his client’s speed was not excessive and that his client had not received a motor vehicle ticket in over 6 years. The client, a disabled longshoreman, received a traffic ticket after being caught at a stationary speed trap, hired Boston Traffic Ticket Attorney Steven J. Topazio to represent him. The client received a marked lane violation after proceeding straight in a “right turn only lane” after the vehicle in front of him which was traveling straight, was signaled by the officer to proceed forward and to pull over. The client followed the officer’s command and proceeded straight in the “right turn only lane”, not realizing that the officer was signaling the vehicle in front of him. Today, Attorney Topazio argued that the reason for the violation was the result of police miscommunication, and persuaded the Clerk Magistrate to find his client Not Responsible. The client, a 55 year old Information Security Auditor, received a speeding ticket after being caught on radar traveling 49 mph in a 30 mph zone, hired Boston Traffic Ticket Attorney Steven J. Topazio to represent him. Attorney Topazio had his client take pictures of the location of the stop which was at the bottom of a hill. Attorney Topazio also had his client obtain a copy of his driving record for the scheduled hearing. Today, Attorney Topazio presented his documentation and argued the equities of the situation, and persuaded the Clerk Magistrate to find his client Not Responsible. The client, a self-employed father of three, received a civil motor vehicle citation for speeding being caught on lidar traveling 58 mph in a 40 mph zone, hired Boston Traffic Ticket Lawyer Steven J. Topazio to represent him. Today at the Judge hearing, Boston Traffic Ticket Lawyer Topazio persuaded the Judge to grant his client consideration due to the fact that his client was polite and courteous to the State Trooper when stopped but was distracted by his passengers, and was unaware of his speed, and the Judge agreed finding his client not responsible. The client, a self employed truck driver from Los Angeles, and holder of a CDL license, received a civil motor vehicle citation for a height violation when he entered the Callahan Tunnel with his 18 wheeler after getting lost on his first trip to Boston, hired Boston Criminal Lawyer Steven J. Topazio to represent him. Today at the Magistrate’s hearing, Boston Criminal Lawyer Topazio persuaded the Clerk Magistrate to grant his client consideration due to the fact that his client was a common working man who made an honest mistake and didn’t see the height restriction when he entered the Callahan Tunnel on his first visit to Boston and the Magistrate agreed. The client, a 21 year old Northeastern College student, received a motor vehicle citation after proceeding through an intersection sideways spinning his tires, hired Boston Criminal Lawyer Steven J. Topazio to represent him at the initial Clerk Magistrate hearing. Boston Criminal Attorney Topazio obtained documentation from his client that BMW his client was driving had defective tires and were replaced one month after the client received the citation. Today, Massachusetts Criminal Lawyer Topazio presented the documentation from his client and persuaded the Clerk Magistrate to find his client not responsible. The client, a 24 year old student at Salem State University, received a civil motor vehicle citation for failing to stop for a red light while passing through the City of Somerville, hired Boston Massachusetts Criminal Defense Lawyer Steven J. Topazio to represent him. The Client wanted to avoid being found responsible and receiving a surcharge to his insurance which would last for six years. Today, Boston Criminal Attorney Steven J. Topazio convinced the Magistrate to find his client not responsible. The client, a 29 year old individual father of three, received a motor vehicle ticket after proceeding straight in a right turn only lane, hired Boston Criminal Lawyer Steven J. Topazio to represent him at the initial Clerk Magistrate hearing. The police officer who wrote the traffic ticket is not required to appear at the initial hearing. Today, Massachusetts Criminal Lawyer Steven J. Topazio persuaded the Clerk Magistrate to find his client not responsible of both offenses. Result: Both offenses dismissed after Clerk finds client Not Responsible. The client, a 50 year old family man and father of three, received a civil motor vehicle citation for a prohibited left turn onto Causeway Street for North Washington Street in Boston, Massachusetts, represented himself at the initial Magistrate hearing but lost and was found responsible. The client appeared the Magistrate’s decision then hired Massachusetts Criminal Attorney Steven J. Topazio for help. Boston Criminal Attorney Topazio pointed out to the court that his client came from Endicott Street where he made a left turn onto Causeway Street on his way to the Massachusetts General Hospital. Today, Boston Criminal Attorney Topazio persuaded the Judge to find his client not responsible. Result: Client found Not Responsible and Case dismissed. The client, a 46 year old cab driver and father of four, received a civil motor vehicle citation while taking a fare from Boston to Hingham, hired Massachusetts Criminal Attorney Steven J. Topazio to represent him. According to the citation, the client was caught on radar traveling 53 mph in a 35 mph zone. Today, Boston Criminal Attorney Topazio persuaded the Clerk Magistrate to give his client the benefit of the doubt and to find his client not responsible. The client, a 26 year old UMASS Amherst student, received a civil motor vehicle citation while on the Mass Pike. The Client initially represented himself at the initial Clerk’s hearing but lost the hearing and was found responsible by the Clerk Magistrate and ordered to pay. A responsible finding would have triggered a license suspension for the client so he appealed. The client thereafter contacted and hired Boston Criminal Defense Lawyer Steven J. Topazio to represent him on his appeal to the judge. Boston Criminal Defense Attorney Topazio had his client obtain a copy of his college transcript and recent repair bills for his car in preparation for the hearing. Today, with Massachusetts Criminal Defense Attorney by his side, the court found the client Not Responsible of all violations. Result: Case dismissed after appeal. The client, a self employed taxi cab driver, received a traffic citation for speeding on the Gilmore Bridge in Charlestown while transporting a fare from the Back Bay to Charlestown, hired Boston Criminal Defense Attorney Steven J. Topazio to represent him. The client was caught on Lidar traveling 48 in a 30 mph zone. Traffic hearings in Massachusetts are civil proceedings requiring the presence of the violator. Boston Criminal Lawyer Topazio researched his client’s driving record and past violations so as to be prepared for the hearing should the issue arise. Although it was just a traffic hearing, effective Massachusetts criminal defense begins with preparation. Today, Massachusetts Criminal Defense Lawyer Topazio persuaded a Clerk Magistrate to find his client not responsible. The client, a manager employed with EMC, received a traffic citation for speeding on the Mass Pike after leaving Logan Airport while traveling towards Worcester, hired Boston Criminal Defense Attorney Steven J. Topazio to represent him. Today, Attorney Topazio persuaded a Clerk Magistrate to find his client not responsible. The Client, a 52 year old father of four, received a civil motor vehicle citation after being caught running a red light, hired Boston Criminal Defense Lawyer, Steven J. Topazio, to represent him at the Magistrate Hearing. Today, Attorney Topazio convinced a Clerk Magistrate to find his Client not responsible. The Client, a 50 year old father of three, received a civil motor vehicle citation after being caught on Lidar traveling 58 mph in a 35 mph zone, hired Boston Criminal Defense Lawyer, Steven J. Topazio, to represent him at the Magistrate Hearing. Today, Attorney Topazio convinced a Clerk Magistrate to find his Client not responsible. The Client, a 52 year old father of two, received a civil motor vehicle citation and hired Boston Criminal Defense Lawyer, Steven J. Topazio, to represent him. Today, Attorney Topazio convinced a Clerk Magistrate to find his Client not responsible. The client, a 49 year old self employed cab driver, received a civil motor vehicle Massachusetts Uniform Citation for making a u-turn in a restricted zone. The Client appealed the ticket and retained Attorney Topazio to represent him at the hearing. Today, Attorney Topazio was successful in convincing to the Magistrate to find his client not responsible. The client, a 22 year old UMASS Dartmouth College graduate, received a civil motor vehicle Massachusetts Uniform Citation for speeding. The citation alleged the client was traveling 55 mph in a 35 mph zone on the ramp into the Tip O’Neal Tunnel or Big Dig Tunnel. The citation further alleged the client was caught on Radar. It is common practice for police to utilize either a Radar or Lidar device to determine a motor vehicle’s speed. RADAR or Radio Detection and Ranging is an object-detection system of electromagnetic waves (radio) used to detect range, altitude, speed, or direction. This signal, called a radio wave, bounces off nearby objects and the echo can be detected by the sender. LIDAR or Light Detection and Ranging on the other hand detects the same thing but uses pulses of laser light. Today, by utilizing his knowledge of the law and advocating for his client, Attorney Topazio was successful in convincing to the Magistrate to find his client not responsible. The client, a 54 year old assistant store manager for Stop & Shop, received a civil motor vehicle Massachusetts Uniform Citation for speeding, and hired Attorney Steven J. Topazio to represent him. The Client wanted to avoid the assessment so as to avoid a surcharge on his motor vehicle insurance. The citation alleged the client was traveling 64 mph in a 40 mph zone. The citation further alleged the client was caught after the officer estimated his speed. Typically speed is determined by Lidar, Radar, or clocking the motorist. Today, Attorney Topazio was successful in convincing to the Magistrate to find his client not responsible. The client, who received a civil motor vehicle citation for traveling 80 MPH in a 55 MPH zone, appealed the citation and hired Criminal Attorney Steven J. Topazio to represent him. Attorney Topazio reviewed the citation which alleged that it was given on a clear dry day and that the Trooper clocked the Client for over ½ mile. Attorney Topazio is aware that exceeding 50MPH for a distance of 1/4 of a mile or more on a divided highway outside a thickly settled area constitutes an unreasonable speed. Today, Attorney Topazio argued that when his client had attempted to merge from the middle lane into the right lane he was blocked by other vehicles and sped up to go around a line of traffic so as not to miss his exit. As a result of his understanding of the hearing process, Attorney Topazio was successful in convincing the Magistrate to find his Client not responsible. Result: Citation dismissed on finding of not responsible. The client, a 40 year old self employed cab driver, received a civil motor vehicle Massachusetts Uniform Citation for speeding. The citation alleged the client was traveling 73 mph in a 45 mph zone on Route 90 westbound in Boston. The citation further alleged the client was caught on Radar after the officer estimated the client’s speed to be in excess of 70mph. A further notation on the citation indicated that there was a huge gap between the Client’s vehicle’s front and rear. It is common practice for police to utilize either a Radar or Lidar device to determine a motor vehicle’s speed. RADAR or Radio Detection and Ranging is an object-detection system of electromagnetic waves (radio) used to detect range, altitude, speed, or direction. This signal, called a radio wave, bounces off nearby objects and the echo can be detected by the sender. LIDAR or Light Detection and Ranging on the other hand detects the same thing but uses pulses of laser light. Today, Attorney Topazio was successful in convincing to the Magistrate to find his client not responsible. The client, a 49 year old self employed cab driver, received a civil motor vehicle Massachusetts Uniform Citation for speeding. The citation alleged the client was traveling 65 mph in a 45 mph zone on Route 90 westbound in the Prudential Tunnel in Boston. The citation further alleged the client was caught on Radar. It is common practice for police to utilize either a Radar or Lidar device to determine a motor vehicle’s speed. RADAR or Radio Detection and Ranging is an object-detection system of electromagnetic waves (radio) used to detect range, altitude, speed, or direction. This signal, called a radio wave, bounces off nearby objects and the echo can be detected by the sender. LIDAR or Light Detection and Ranging on the other hand detects the same thing but uses pulses of laser light. Today, Attorney Topazio was successful in convincing to the Magistrate to find his client not responsible. The client, a 37 year old cosmetics consultant, received a citation with a civil assessment for $500.00 for entering onto Route 93 in the wrong direction. The client was initially stopped by a detail officer who was working at the entrance of the tunnel and who ordered the client to reverse direction. In attempting to reverse direction, the client crashed into the police cruiser causing approximately $1800.00 damage to her vehicle, and was put through field sobriety tests and was cited. The client represented herself at the Magistrate’s Hearing but didn’t fare as well as she liked and was found responsible. The client appealed the Magistrate’s decision but hired Attorney Topazio to represent her before a Judge. Attorney Topazio investigated the event and discovered the State Police were in possession of a tunnel video which captured the entire event. Today at hearing, Attorney Topazio represented to the court that his client became disoriented when she entered the tunnel the wrong way due to following the commands of her GPS. Attorney Topazio pointed out to the court his client’s good driving record and established that there was no issue as to his client’s sobriety on the night in question and argued that his client should be found not responsible, and the Court agreed. Result:Client found not responsible after hearing. The Client, a 24 year old Real Estate agent, who needs to travel by way of her motor vehicle as part of her employment, received a citation for failing to yield to a pedestrian in a crosswalk, and hired Attorney Topazio to represent her. Attorney Topazio advised his client to appeal the citation and to pay the required $25.00 processing fee. Today, Attorney Topazio was successful in convincing the Clerk Magistrate to give his client the benefit of the doubt and to find her not responsible. The defendant, the owner of courier service who relies on his driver’s license to earn a living, received a citation from a State Trooper for speeding, traveling 52 mph in a 35 mph zone, hired Attorney Topazio to represent him. Today, Attorney Topazio, as a result of his experience and understanding of the different ways of resolving traffic violations, was successful in persuading the Clerk Magistrate to find his client not responsible, despite his lengthy driving record. Result: After hearing Defendant found not responsible and maintains his driver’s license, protecting his livelihood. The defendant, a Boston cab driver who relies on his driver’s license to earn a living, received a citation from a State Police Officer for failing to stop at a red light when driving to the airport, hired Attorney Topazio to represent him. The client was stopped when he followed a second cab heading to the taxi pool as he was unfamiliar as to where to go and got confused by the terminals. Attorney Topazio instructed his client to appeal the citation so as to be granted a Magistrate’s hearing. Attorney Topazio argued that his client followed the other cab and failed to stop because he was afraid to get lost. Today, Attorney Topazio, as a result of his experience and understanding of the different ways of resolving traffic violations, was successful in persuading the Clerk Magistrate to find his client not responsible. The defendant, who received a citation for speeding, traveling 85 MPH in a 65 MPH zone, which was captured on Lidar at a distance of 1581 feet, hired Attorney Topazio to represent him. LIDAR (Light Detection And Ranging) is an optical remote sensing technology that can measure the distance to, or other properties of a target by illuminating the target with light, often using pulses from a laser. Today, Attorney Topazio, as a result of his experience and understanding of the different ways of resolving traffic violations, was successful in persuading the Clerk Magistrate to find his client not responsible. Result: After hearing Defendant found not responsible. The defendant, the owner of courier service who relies on his driver’s license to earn a living, received a citation from a Brookline Police Officer for a marked lanes violation, and hired Attorney Topazio to represent him. The client was stopped after negotiating a lane change over a solid white line which indicated that it was prohibited to do so. Today, Attorney Topazio, as a result of his experience and understanding of the different ways of resolving traffic violations, was successful in persuading the Clerk Magistrate to find his client not responsible. The defendant, a Boston cab driver who relies on his driver’s license to earn a living, received a citation from a Boston Police Officer for speeding, no inspection sticker and no license or registration in possession, hired Attorney Topazio to represent him. The client was stopped while driving his son’s car, which was recently purchased, but due to mechanical problems, was not inspected. Attorney Topazio instructed his client to appeal the citation so as to be granted a Magistrate’s hearing. Attorney Topazio had his client bring the purchase documents on the car to the Magistrate hearing. Today, Attorney Topazio, as a result of his experience and understanding of the different ways of resolving traffic violations, Attorney Topazio was successful in persuading the Clerk Magistrate to find his client not responsible. The defendant, a Boston Cab Driver and father of two, was given a civil motor vehicle citation for making an illegal U-turn where it was posted no U-Turn. The defendant initially represented himself at a Magistrate Hearing but was found responsible and appealed to a full hearing in front of a Judge. After appealing, the client hired Boston Criminal Defense Lawyer Steven J. Topazio to argue his case. Today Attorney Topazio conducted a full hearing with the citing officer and established that despite the posted no U-Turn sign, his client was cited for violating a general safety statute but in fact exercised extreme caution and safety in executing the U-turn; turning the cab around at a location where the double yellow line on the roadway was broken and further did not interfere with the movement of traffic. Attorney Topazio convinced the Judge to find his client not responsible. The defendant, a Boston Cab driver, was cited for making an illegal turn with his cab while transporting a fare, hired Boston Criminal Defense Lawyer Steven J. Topazio to represent him at a Magistrate’s hearing. The defendant who leases his medallion could not afford a responsible finding the citation he received and had not fared well as a cab driver in the past representing himself. Today, Boston Criminal Defense Lawyer Steven J. Topazio convinced a Clerk Magistrate after hearing to find his client not responsible. The defendant, a Boston cab driver who relies on his driver’s license to earn a living, received a citation from a State Trooper for not using the easy pass lane when entering the Sumner Tunnel as required by law, hired Attorney Topazio to represent him. Attorney Topazio instructed his client to appeal the citation so as to be granted a Magistrate’s hearing so he could contest the citation. Today, Attorney Topazio, as a result of his experience and understanding of the different ways of resolving traffic violations, persuaded the Clerk Magistrate to find his client not responsible. Result: After hearing Defendant found not responsible and maintains his client’s driver’s license, protecting his livelihood. The defendant, who had previously been found responsible for two moving violations this year after representing himself, was facing a 30 day license suspension after receiving his third moving violation in one year (if found responsible), hired Attorney Topazio to represent him this time. The client, who was on his way to the airport to pick up his girlfriend, was given a citation for speeding after being stopped in the Ted Williams tunnel after radar indicated that he was traveling 55 in a 35 mph zone. Today Attorney Topazio convinced a clerk magistrate to find his client not responsible. Result: Not Responsible and license not suspended. The defendant, who operates a courier service, was given a citation for speeding and not wearing his seat belt, hired Attorney Topazio to represent him at a Magistrate’s Hearing. Today, Attorney Topazio argued that his client, who was nervous when stopped by police, instinctively went to remove his seatbelt which he thought was on, and was accused of being untruthful by the officer when questioned on that point. Attorney Topazio convinced the Magistrate to give his client the benefit of doubt and requested that his client be found not responsible, and the Magistrate agreed. Result: Defendant not responsible, case closed. The defendant, a local taxicab driver, received a citation for speeding. The citation indicated that the defendant was allegedly caught on Radar traveling 66 mph in a 45 mph zone. The client hired Attorney Topazio. A basic summary of how radar works is that a pulse is transmitted and any return or echo is listened for. If a return is sensed, the timing between the transmission and the reception of the echo is used to determine how far away an object is. However, there are many shortcomings to traffic radar. First of all, radar is prone to interference. The radar’s antenna will accept any microwave that it is able to “hear”. The antenna might not be “hearing” the waves which originated from its own unit. High voltage power lines, telephone lines, power stations, even neon lights emit electromagnetic waves. The specific source of the wave cannot be identified. Secondly, radar cannot determine which target reflected off the waves. If there are two cars both travelling in a close proximity, either car could be responsible for the resulting radar reading. Identifying the target is a job left to the radar operator, who frequently makes mistakes. At a distance of 200m, the width of the radar beam can usually cover all 4 lanes of traffic travelling in both direction, causing a large error in determining which car is responsible for the radar reading. Even if there is only one vehicle on the road, radar has a typical range of approximately 400m (1200 feet), which is beyond the visual range of most human eyes. The radar might be clocking a speeder at a distance of 300m, but the officer can only see an innocent driver coming towards him at a distance of 100m. Today after a Clerk’s hearing, Attorney Topazio convinced a Clerk Magistrate to find his client not responsible. The defendant who was stopped behind a second motor vehicle at Roosevelt Circle, received a citation when he passed that vehicle on the right because the operator of the second vehicle was talking to an operator of a third vehicle and was not moving, received a citation. The client hired Attorney Topazio. Today after a Clerk’s hearing, Attorney Topazio convinced a Clerk Magistrate to find the driver not responsible, thus preserving his clean driving record. Result: Defendant operator not responsible, case closed. Title 730 of the Code of Massachusetts Regulations prohibits passenger or commercial vehicles carrying any amount of hazardous material, excluding those materials required for the actual operation of the vehicle, to enter or to use the Tunnels. The defendant, a West Virginia paint company, received multiple citations for entering the Thomas P. O’Neil Tunnel with buckets of paint primer, finish, caulking and cans of gas. The citations charged both the driver and the corporation. The client hired Attorney Topazio. Today after a Clerk’s hearing, Attorney Topazio convinced a Clerk Magistrate to find the driver not responsible, thus preserving his clean driving record, upon acceptance of responsibility of a single violation by the corporation. Result: Defendant operator not responsible, corporation accepts responsibility, case closed. The defendant, a resident of Illinois, who was in Boston for a convention, received a citation for speeding. The citation indicated that the defendant was allegedly caught on Lidar traveling 61 mph in a 45 mph zone. The client hired Attorney Topazio. LIDAR is an acronym for LIght Detection And Ranging. A police laser emits a highly focused beam of invisible light, in the near infrared region of light that is centered at 904nm of wavelength and is only about 22 inches (56cm) in diameter at 1000 feet (300m). Unlike police RADAR which directly determines a vehicle’s speed by measuring its doppler shift, police laser-lidar calculates speed by observing the changing amount of time is takes to “see” reflected pulses of light over a discreet amount of time. Today after a Clerk’s hearing, Attorney Topazio convinced a Clerk Magistrate to find his client not responsible. The defendant, a Boston Cab driver, received a citation for failing to stop and represented himself at the initial clerk’s hearing, but was found responsible by a Clerk Magistrate, hired Attorney Topazio for his appeal before a Judge of the court. Today after argument, Attorney Topazio persuaded the Court that his client did not violate the law arguing that the officer’s view of his client stopping would have been obstructed by a building based on the officer’s viewpoint and what the officer in fact saw was his client’s second attempt to enter the flow of traffic. Result: Defendant not responsible, prior ruling reversed, case closed.